Haplophragmoides wilberti, copyright Bruce Hayward. 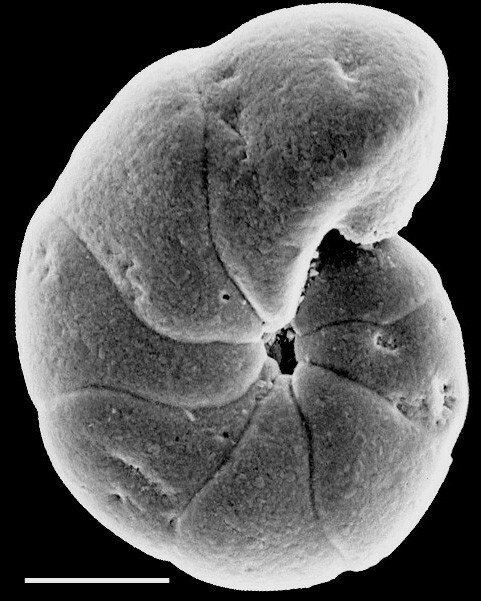 Haplophragmoides is a genus of planispiral Foraminifera known from the Carboniferous to the present day (Loeblich & Tappan 1964). Characters (from Loeblich & Tappan 1964): Test planispirally coiled, involute; wall agglutinated, aperture an equatorial interiomarginal slit. [I02] Ibrahim, M. I. A. 2002. Late Albian-Middle Cenomanian palynofacies and palynostratigraphy, Abu Gharadig-5 well, Western Desert, Egypt. Cretaceous Research 23: 775–788. [PH03] Pawlowski, J., M. Holzmann, J. Fahrni & S. L. Richardson. 2003. Small subunit ribosomal DNA suggests that the xenophyophorean Syringammina corbicula is a foraminiferan. Journal of Eukaryotic Microbiology 50: 483–487.